Chinese 3D tech company Sanya Sihai has created a bright orange electric-powered sedan which cost just $1,770 to manufacture. 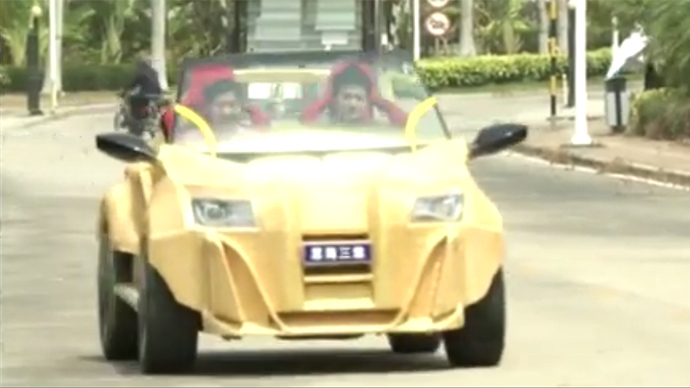 Sanya Suhai unveiled the vehicle, China’s first 3D printed car, on Tuesday in the country’s southern Hainan province. Building the vehicle reportedly took 1.5 months, with the printing part of the process taking about five days. The fully functioning sedan was printed in a filament dubbed 'Tyrant Gold' and cost just $1,770 to build. It was printed using low-cost composite materials. The vehicle, which is powered by rechargeable batteries, can reach speeds of up to 40 kilometers per hour (24 mph). The world’s first 3D printed car, the Urbee, was created in the US in 2013 by design firm KOR EcoLogic, direct digital manufacturer RedEye on Demand, and 3D printing manufacturer Stratsys. Last year, the Arizona-based Local Motors printed the Strati car. The company has plans to custom print 3D cars for clients on demand. Once more are produced, the Urbee’s sticker price will likely be between $16,000 and $50,000, while the Strati will probably cost between $18,000 and $30,000. Last Spring, Chinese company WinSun Decoration Design Engineering Co. printed 10 single-story 3D-printed homes in under 24 hours. In January, WinSun used 3D printers to create a five-story house using construction wastes. It was the tallest building to ever be 3D printed.